Fun Flips is a way to bring your parties to life with the newest craze in customized party favors. 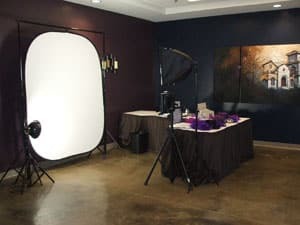 We set up a display in a 10’x10′ area at your party or event and invite guests to step behind the camera and make a short video clip. In a minute-and-a-half, we turn the video clip into a personalized flipbook while partygoers watch. 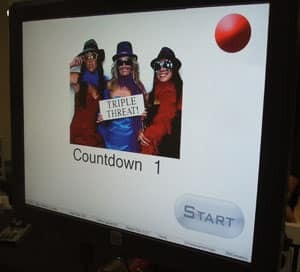 It creates a buzz as your guests watch each other make a short video clip dancing, blowing kisses, or simply having fun just being themselves! The video is then printed and put through our cutter and bound into a small book right before their eyes! When they flip through the book, they will smile in astonishment that they can see the video they just made right inside! Your guests will forever have a customized keepsake that will brighten their day for years to come. FunFlips averages 45 flipbooks per hour and is versatile enough to fit into any party setting, from casual to couture. This allows for plenty of opportunity for all of your guests to make a flip book – it’s immediate gratification! 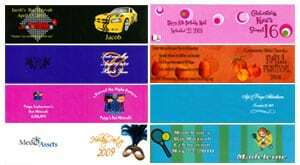 We customize our flip book covers to match your event.